SGTA, 1-313aa, Human, Recombinant, 01-1817 | ARP American Research Products, Inc.
SGTA, also known as SGT or hSGT, is a ubiquitously expressed protein that contains three TPR protein-protein interaction repeats. This protien is believed to function as a component of the androgen receptor (AR)-chaperone-cochaperone complex, acting as a cochaperone involved in androgen signaling. In addition, SGTA functions as a cochaperone that binds directly to HSC70 and HSP70 and regulates their ATPase activity. On the basis of its role in apoptosis and androgen signaling, SGTA is a potential candidate for PCOS (polycystic ovary syndrome), a disorder characterized by androgen excess, obesity and menstrual disturbances. Recombinant SGTA protein, fused to His-tag at C-terminus, was expressed in E.coli and purified by using conventional chromatography techniques. 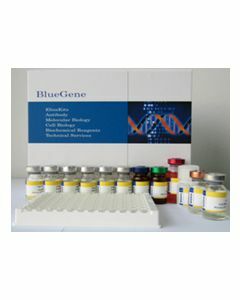 alphaSGT, hSGT, SGT, Small glutamine-rich tetratricopeptide repeat-containing protein alpha Small glutamine rich tetratricopeptide repeat TPR containing alpha, UBP, Vpu binding protein. Cziepluch C., et al. (1998) J Virol. 72(5):4149-56. Callahan MA., et al. (1998) J Virol. 72(6):5189-97.